Unlike many of our competitors, Waterways is able to offer whole house water solutions due to our superior and extensive range of water treatment and filtration technology. We use water every day around the home. Whether it’s in the kitchen, the laundry, the bathroom or outside, water is an integral part of our day-to-day life. With water playing such an important part of what we do, it makes sense to use the best and the healthiest water available. That’s why we provide whole house filtration and can consult on, design and install a system designed specifically for your home. Our water filtration systems give you and your family an unlimited supply of safe, clean and pure water. This water is not only enjoyable to drink, with impurities and pollutants removed, the water is easier on your plumbing, appliances and fixtures, skin, hair and general health. We understand that not everyone’s water source is the same; while many people use mains water, others use bore water or rain water. As a result, we can install systems for all water sources. In addition to water source, we also take into account the size of your house. 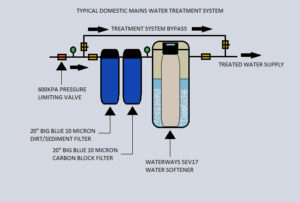 Our Big Blue Filtration Systems have been designed to handle the large amounts of water used by domestic homes, and compliment these with mixed bed systems, carbon filters and high flow systems for larger flow rates. With a range of sizes available, you can be sure we’ll have one to suit your household. The Big Blue Filter Systems are for dirt, sediment, chlorine, colour and odour removal. A Water Softener removes calcium and magnesium to give our lovely blonde website model her beautiful, soft luscious hair. It lathers soaps better, prevents scale build up on fixtures, metal & glass surfaces etc. (used for mains water and bore water). The Waterways Ultra-Violet System kills bacteria as it passes through the chamber. Mainly used for rainwater systems and bore water systems not commonly used for mains water as the water authority chemically treat the municipal water supply. (used for rain water and bore water). Our Calcite pH Correction Systems raises the pH level in acidic water to a neutral of 7. Commonly used in rainwater treatment systems to prevent acidic rainwater from attacking copper pipework causing green staining on fixtures and fittings. To install any whole of house water treatment system we cut into the existing cold water feed to the house, re-route the pipework to feed through the treatment system then connect it back to the existing feed so that the entire house can be supplied with treated water. To arrange a whole house filtration system for your home, get in contact with us today. We can provide you with the perfect system, giving you and your family access to clean, safe and refreshing water throughout your entire home.